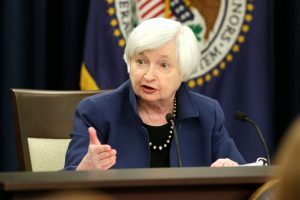 WASHINGTON — Former Federal Reserve Chair Janet Yellen says she doubts that President Donald Trump has a good grasp of economic policy or even knows the Federal Reserve’s mandates. She said Trump has made various inaccurate remarks about the Fed such as that the central bank has an objective for the exchange rate for the dollar that is aimed at supporting the president’s trade policies. The comments marked Yellen’s most pointed criticism of Trump since he decided not to nominate her for a second term as Fed leader. She left the Fed a year ago and was succeeded as chairman by Powell. Trump last year was sharply critical of the Fed’s string of interest rate hikes, saying they were depressing stock prices and represented his biggest threat. However, since the Fed signaled in January that it planned to be “patient” in moving rates higher, an announcement that has triggered a stock rally, Trump has softened his comments. He had what was described as a cordial dinner with Powell and Fed Vice Chairman Richard Clarida earlier this month. Left: Former Federal Reserve Chair Janet Yellen said in a radio interview that she doubts President Donald Trump has a good grasp on economic policy. File Photo by REUTERS/Yuri Gripas.